Being a modern-day Paid Media Manager can make you feel a bit like Sisyphus. 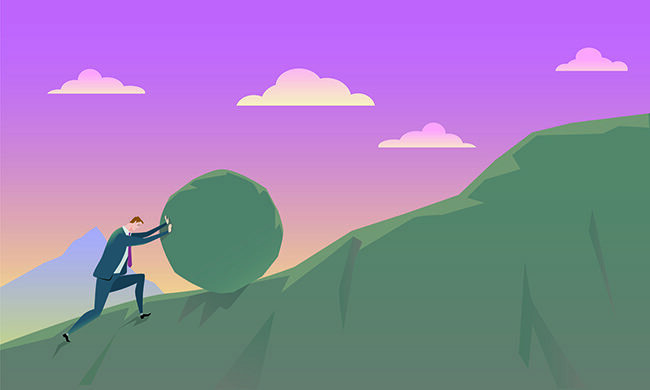 Your VP of Marketing has charged you with rolling a boulder uphill (continuously optimizing your AdWords campaigns even when you’ve reached your quarterly objectives). This becomes especially painful when you’re getting diminishing returns out of your optimization efforts. There are many tactics to choose from, but many of them may be a waste of time and may leave you with minimal impact. When the going gets tough, you need to get creative and find cost/time-effective ways to keep optimizing your campaigns as granularly as possible. Here are five advanced strategies for getting big optimization wins in AdWords. Am I getting the full value out of my existing target market? Chances are, you’re losing market share for your target keywords (and locations) due to budget caps. To grow your campaigns, reduce the market share loss due to budget caps. Reality check: Are you losing market share due to budget? Check the “Search Lost IS (Budget)” metric in Google AdWords. You’ll find it in the Competitive Metrics category. So what’s your number? 2%, 12% or 32%? Here’s an example: our client’s account was losing up to 32% of market share due to budget by week four. That means they were pacing stronger at the beginning of the month, but needed to slow down towards the end of the month to meet the monthly budget goal. Once you know how much market share you lost at account level, you can dig deeper into the campaign level data. You’ll know exactly which campaigns contribute to the loss. Those gems are your growth opportunities. Great. Your CPL is healthy. Get more of it. Increase budgets. Poor. Your CPL is high. You’ll spread the poor performance wider by increasing the budget. You won’t make it up by volume. Reduce budgets so you can allocate more spend to the performing campaigns. Borderline. Your CPL needs work. Work on reducing the wasted ad spend and start raising your daily budgets — slowly. Sort campaigns by Conversions and CPL. Group campaigns into Shared Budgets based on performance. We like to have four groups — B1 through B4 — based on importance, where B1 has no budget constraints, and B4 has the most budget constraints. Calculate required monthly spend. Sum each campaign category by cost for the month. Make sure all campaigns fit in your monthly budget. Allocate respectively. Use maximum required budget for B1 first, then B2, B3, B4. Here’s something else you can do to grow your AdWords campaign. Another great way to grow your AdWords campaigns is to reduce lost market share due to low Ad Rank. If you’re not familiar, I’ll give you a quick, practical overview. I will skip ad extensions, as most serious advertisers use them already (and I hope you’re one of them). The two variables that matter are your bids and your Quality Score. If they stay constant in your account, but your competitors keep increasing theirs, your Ad Rank relative to competitors decreases and your market share (impression share) is lost due to Ad Rank increases. Reality check: Are you losing market share due to Ad Rank? 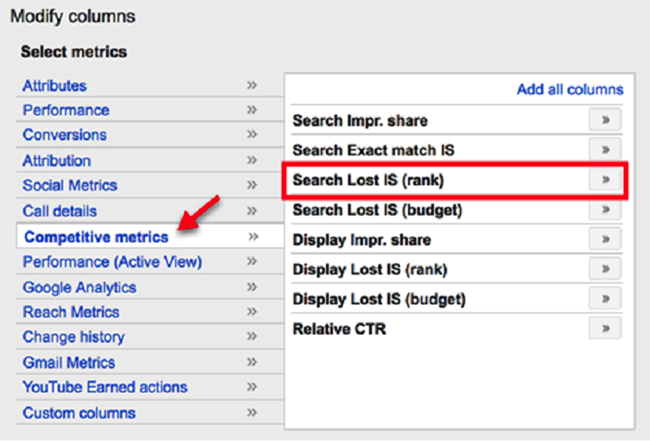 Just as you did with your budget, check the “Search Lost IS (Rank)” metric in Google AdWords. It’s in the Competitive Metrics category. Once again, find your number for both the account and campaign levels. Once you know, you’ll know what direction to take things in. If your Quality Score is high already (attempts at improving it may result in diminishing returns or a negative impact on your conversion rate), and your CPLs are healthy, you have no other choice but to increase the bids. Your CPL will go up, but you can gain a lot more conversions. Your ad’s expected click-through rate: This is based, in part, on your ad’s historical clicks and impressions. You can think of this as an estimate as to how well your ads might perform, after factoring in things like extensions, and other various bells and whistles that impact performance. Your ad’s relevance to the search: How relevant your ad text is to what a person searches for. The quality of your landing page: How relevant and user-friendly is your landing page? Recently, Google has improved its Quality Score reporting. You can see the makeup of your score using historical data. This helps you to evaluate how the previous account changes affected your score. The problem: you can’t take your Quality Score to the bank. It’s not a KPI. Given that, if your conversion rates are healthy, don’t sacrifice your results for the sake of Quality Score. Yes, you may improve your Quality Score a bit, but if your conversion rate tanks, cheap clicks won’t matter. Improve your landing page (with focus on improving CVR). 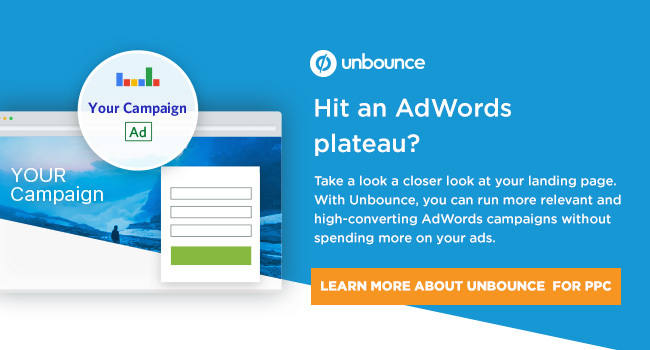 I recommend using Unbounce to create highly relevant landing pages focused on conversions. You can improve their relevancy with Dynamic Text Replacement, responsive design and fast loading times. Once you’re satisfied with the conversion rate, go back to increasing the bids. On to the next move you can make to strengthen your campaigns. Buyers have different stages in their journey. You need to understand the buying stages for your customers, understand their differences and finally adapt your marketing to them. To illustrate the difference between them, I’ll use an example that revolves around unicorns. Let’s say you kept your unicorn enclosed in a submarine for a few years. Your unicorn was exposed to asbestos and got a sick with mesothelioma. You decided to sue the owner of the submarine and you started looking for a lawyer. A good one. Someone like Saul Goodman. Awareness – early in the process. Looking for ideas or trying to identify the problem. Far from making a decision. Example: looking for symptoms or treatment options. Consideration – considering potential options. Not ready to make a decision. Example: looking to find out how the settlement amount for getting your poor unicorn sick. Decision – ready to make a decision. Looking for a solution. Example: looking for a lawyer. Reality check: Are your campaigns assigned to specific buyer stages? 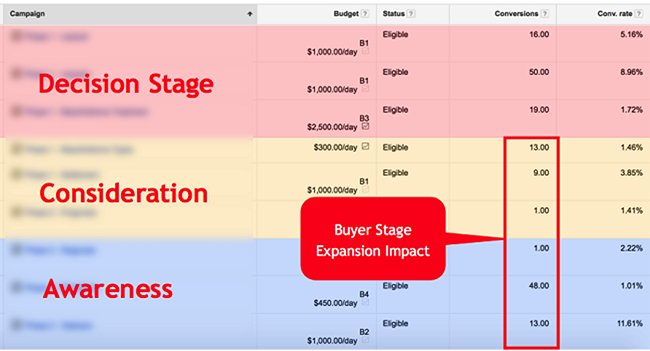 Go through your campaigns and map them to the appropriate buyer stages. If you’re not deliberate on your buyer stages, your conversion rate may be affected due to poor matching between the offer and the intent of the buyer stage. Think of the traffic temperature concept covered by Molly Pittman and Johnathan Dane. Then, review your offer and make sure it matches the intent of the buyer stage. Once you map your campaigns to specific buyer stages, identify the opportunities to expand. Expand into the stages that you haven’t covered. For example, if you’re focusing on the decision and consideration stages, expand into the awareness stage. Perform keyword research for the new campaigns within the missing stage. Develop offers that represent the intent of the buyer stage. Create the ads and landing pages that reflect the offer. Let’s take a look at the next step you can take toward growing your AdWords campaigns. Locations may be an overlooked avenue in which to expand. Let’s say you own a unicorn breeding business and are targeting locations within a certain radius of your office. You assume you should be targeting people living near your business. People commute and search during their commutes. The average commute time to work in the U.S. is 25 minutes, which averages out to approximately 15 miles. A good number of people take public transportation to work. For example, in 2016, Americans took 10.4 billion trips on public transportation. People search at work. According Salary.com survey, 64 percent of employees visit non-work related websites every day at work. If you don’t have these in your targeted locations, you’re missing out. For example, one client, selling custom kitchen cabinets, provided us with a recommended list of locations with a wealthy population. We ran ads at those locations and the traction was small. We didn’t use the whole budget. Then, we identified a new set of geographies — where the target audience may be working — and tested again. The leads went up by 155% in month 1 (after the change) and 30% more in month 2. Reality check: Are you targeting all possible locations? Check your target locations. Are you targeting based on where people live, commute and work? If you’re missing any location categories, identify them. Commuter locations. People within the existing market commuting. Work locations for existing market. People within the existing market at work. New locations for new market. New locations to reach a new audience, provided your business can operate in them. Once you get a customer, your goal is to increase their lifetime value. I’ve covered customer lifetime value extensively in another article. Let’s take Starbucks, for example. There’s a reason why they’re one of the unicorns of the industry. 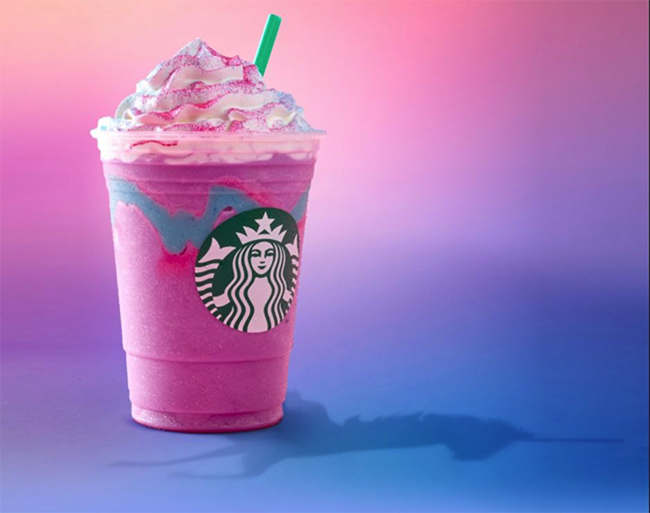 Their marketing isn’t focused on selling a five-dollar Unicorn Frappuccino (they actually exist), it’s about acquiring a loyal customer who will generate $14,099 over the lifetime. Reality check: Do you have a unique offer you could sell to acquire new customers? Consider cell phone companies. Their core product is not the cell phone. It’s the subscription service. 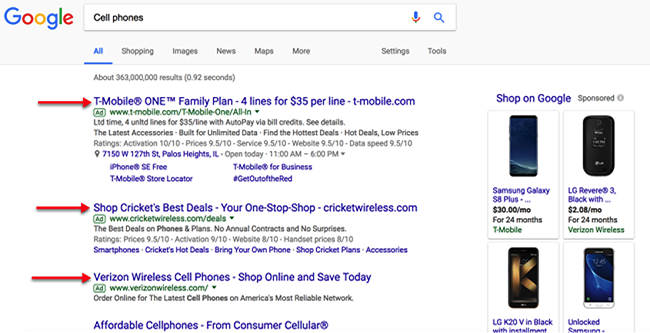 See what happens when I search for “cell phones” — I get ads from the cell phone companies. These companies expanded their offers to include additional products that serve as new entry points for new customers and growth. My question to you is this — do you have a new offer you can use to acquire new customers? Research your customers to understand their expectations. I’ve covered four research methods in a separate article. Create your offer tied to the core product first. Perform keyword research representing new offer. You made it! Now, you have five different ways to grow your AdWords campaigns. Remember, start with the analysis first, and take action second. Once launched, don’t forget to evaluate often, and revise. Your analysis isn’t always right. You need to try, try, and try again — until you find success. What effective ways have you found to grow your AdWords campaigns? Share in the comments below. Tom Bukevicius (boo-ka-vicious) is a Principal at SCUBE Marketing, ecommerce marketing agency delivering results through PPC and CRO. Tom’s motto is, “Magic bullets are for losers. Execution is key." Check out Tom’s new SCUBE Rating self-assessment to improve paid search campaign efficiency.